From 1975 -1978 Parousia didn’t have a professional manager or booking agent. Most of our gigs came by way of friends who were on a student council or by one of us calling a club and talking directly with the manager. That all changed in February of 1979 when the band met Phil Christopher of Multi-Media attractions. Phil became our first formal booking agent, signed contract and all. 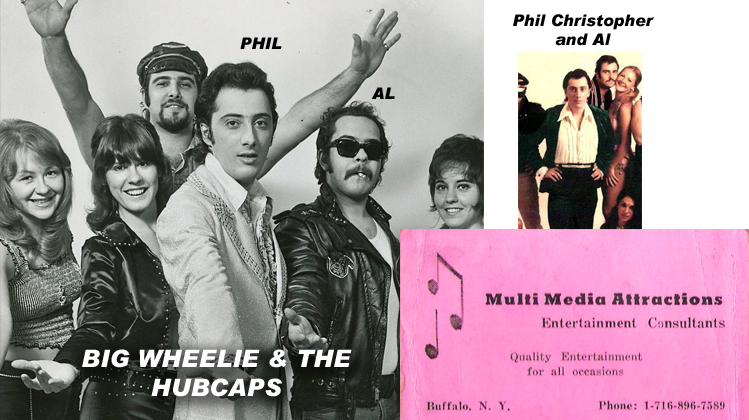 Phil’s entertainment experience came mostly by way of performing in a popular 50’s cover band known locally as “Big Wheelie & the Hubcaps“. Phil was a big help to us when we were just starting out. He let us rehearse our songs in his garage on Voorhees Avenue near Hertel Avenue… in the dead of winter with no space heater. Our hands were so cold that even with gloves on it was nearly impossible to play our instruments but we did the best we could. Phil claimed that the reason he booked our band way-out of town in Chaffee, NY was to give us a chance to refine our show while keeping us away from the tougher competition in the big city of Buffalo. We agreed with that philosophy to some extent but what else what could we say… we were content to finally perform at a club that wasn’t McVan’s. Phil didn’t invest a lot of money in Parousia and he printed our promotional materials on a Sears Mimeograph machine (remember the smell) …and it really bothered me that Al, (Phil’s “assistant”) spelled our name incorrectly as “Perousia” arrgh! I remember Phil asking our band to “pick a musical direction”. He thought that our choice in music was “all over the place” and needed to be fine-tuned. And so we were faced with a curious choice… Should we pursue our music career as a pop band, a progressive rock band or a hard rock band? Well, we thought about it and if we were going to have a category forced upon us we chose progressive rock. Bob hugged and kissed his bass when we all agreed and then we shivered like icicles in that damn garage while we completely ignored what Phil said and continued to play the songs that we wanted to play. That summer we got a break when our band performed live on the late night WBFO college radio station “Oil of Dog” hosted by D.J. Gary Storm. Phil was hoping we would go in a more pop direction with our music but we did our own thing and it seemed to be working. It wasn’t long before Phil moved on to other projects and after six months of performing and recording around town we were picked up by two new agencies, Adventure Productions and Backstage Productions. In December of 1979, Eric Scheda, (keyboard wizard) joined PAROUSIA and we were ready to step it up a bit musically and visually. We began to take on songs that were more challenging and worked on presenting the songs in a unique way. We wove together songs from our set list to form a mini “rock opera” based on the theme “Good vs. Evil”. It was known among us as “the show set” which we started to perform in clubs in the summer of 1980 not long after our first recording session at Filippone sound where we laid down “Malmedy”, “Revelation”, “Miss Ogyny” and “Oh My Love”. While we were rehearsing in Keith Gregor’s Music Mall in Cheektowaga, there was a band across the way from us in room #6 called JDM Hybrid. They were managed and booked by Adventure Productions who we immediately became interested in. We met with Georgine Tramontana in July of 1980, shortly after she attended our performance at a little club called the Plant-6 on Niagara Street. Georgine liked our band and wanted us to sign an exclusive deal. No one else could book us into clubs, schools or parties not even one of our own band members. This was exactly the kind of thinking we were trying to avoid with companies like Great Lakes Booking and its various tentacles like Starstruck Entertainment. BUT…we really wanted her help and she really wanted Parousia to be on her roster and so we struck a deal. We didn’t have to sign exclusive but Adventure would take a higher cut. We premiered the show-set on July 20th at Melanie’s where Backstage Productions saw us and heard us for the first time. Almost immediately after, Parousia entered into a booking and management agreement with Dave Buffamonti and Rick Falkowski which helped our band gain a much stronger presence in Buffalo and the surrounding cities. When Georgine saw that we were working well with Dave and Rick at Backstage she didn’t put forth a lot effort into managing us, although Adventure Productions did continue to book us on and off for the next two years, the last time being September 11, 1981 where we performed with JDM Hybrid in the Buffalo State College Social Hall. With the help of both Backstage Productions and Adventure Productions we were propelled upward onto a new level and suddenly we were playing everywhere all the time through 1980 and 1981. In 1981 I knew Jim Couch from Tops Supermarket and I introduced him to Dave Buffamonti who took on his band called Future History. Many of the band members were “Kenmorons” from Kenmore, NY. Our relationship with Backstage Productions and its various subsidiaries lasted many years and even when Parousia broke up and reformed, Rick was there to help us out. 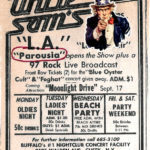 When Parousia remade itself in 1982 as a band playing all of our own music, we really appreciated Rick’s help in bringing us back into the limelight. Rick was great at working deals. Like the time the entire band got free professional haircuts at Santangelo’s and free recording time at Loft Studios. 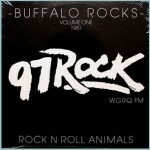 In exchange, Rick gave them free advertising space in his local music magazine Buffalo Backstage. Rick put us on stage at the first Buffalo Backstage Music Awards show and we were taped live and aired later on TV. 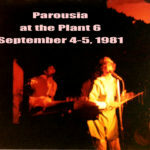 Rick booked Parousia into a concert performance at the Port Colborne arena in Canada when the local super-group Talas had to suddenly cancel their appearance at that venue. Rick helped out with equipment too and lent us his personal ARP synthesizer because we couldn’t afford to buy a keyboard that made a realistic string and chorus sound. Rick’s wife, Marsha Falkowski pitched in with photography and shot some very cool 35 MM photos of the band at Forest Lawn Cemetery in August of 1980. Parousia Mailing List sign-up card. After recording four new songs at Loft studios and creating a music video in 1984, we hit the recording studio three more times in 1985, starting in July at Filippone sound, (where we recorded six songs) and then in October, at Select Sound (where we recorded ‘Place your Bets’). About this time the band was itching to get onto a college circuit tour and as luck would have it, we drew interest from an interesting fellow from England, Mr. Colin Hilborne. Colin Hilbourne. Parousia Manager from 1985-1988 Bob’s Big Boy, Culver City, CA. Colin had a great deal of experience in the music industry and was an ex-roadie for Elton John & the Faces. Back in England, he knew many of the British Invasion bands from the 60’s and 70’s and had many interesting stories to tell about some of them like Ronnie Wood, Keith Richards and Elton John (who according to Colin was particularity fond of being called ‘Elsie’ by his band mates backstage). Colin recognized talent and we were flattered to know that he saw that in us. Colin suggested he produce three new songs to compliment the “Place your Bets” track we had just recorded over at Select Sound and then put it all together to release an EP. We agreed and in November we began recording at the studio of his choice, Mark Studios in Clarence, NY where we laid down, “Turnaround,” “Tiffany” and “Graduation” – The result of which formed our first commercially released Cassette EP, titled “Turnaround”. Turnaround was released in October of 1987 on the ‘Rock Dog Records’ label in Hollywood, CA. The Hollywood release is credited much to the urging of our mentor Colin, who convinced us that if we were serious about our music we should take the band out west in a market where there was a better chance to be seen by someone who could take it to the next level, get us a record deal and start a tour to promote it. Out in California, Colin continued to mentor us and encourage us to find someone who could put us on tour. When I was working for Crawford & Company I handled claims for various Entertainment Brokers. AON was one of those and I met Marianne there, an underwriter at the brokerage. She handled live recording artists. Many were touring bands and she became involved in personally managing some of the acts. She formed relationships with the local rock clubs like the Troubadour, the Whisky and the Roxy on the sunset strip. When she saw what Patt and I were putting together, she wanted to be a part of it. 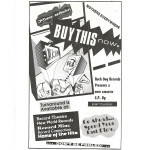 Patt and I recorded a demo tape with keyboards, drums and vocals. We used that demo to attract like-minded musicians who could act and then booked a dress rehearsal at Uncle Studios in North Hollywood. From that very first rehearsal Marianne took the promotional reins and started creating press and connections for our band. She was a true friend to the band and had us over for food and drinks on many occasions. She mothered us and mentored us and invested heavily in our production of Virtual Reality by providing up front financing for shows at the Troubadour, the Whisky and the Roxy Theatre. We couldn’t have carried all that weight by ourselves and Marianne did a fantastic job of promoting and managing our act. We couldn’t have done it without her.